Plot: The USS Copernicus, lost in space for a hundred years, drifts past Babylon 5 and is salvaged. The vessel was launched shortly before Earth made contact with the Centauri and gained jump gate technology, allowing them to take to the stars. The slower-than-light cryogenic freezer ships launched to colonise other star systems were virtually forgotten. One of the ship’s crew has survived, but the other is dead. Dr. Franklin revives the survivor, Mariah Cirrus, but discovers that her husband did not die of natural causes. Meanwhile, Garibaldi encounters a lurker named Amis who appears to be deranged, continuously claiming that an alien force is coming for him. Calming him down, Garibaldi learns that Amis, like Garibaldi himself, was in the marines (“ground-pounders”, or GROPOS) during the Earth-Minbari War. An alien unlike anything seen before destroyed the listening post he was serving at and only Amis survived. Since then he has felt that the alien is drawn to him. Lurkers start turning up dead in Downbelow and both the Narns and Markabs (one of the non-aligned races) begin claiming that an alien force has come onto the station from the Copernicus. Garibaldi uses Amis to flush out the creature and he and a security team manage to kill it. Mariah returns to Earth to investigate this new future, whilst G’Kar finds a picture of the alien in The Book of G’Quan. Ivanova examines the course of the Copernicus and discovers it was headed for the same planet G’Kar visited a few weeks ago: Z’ha’dum. The Arc: The alien creature is referred to as a ‘dark servant’ of the Shadows rather than an actual member of the same race (though it has the ability to turn invisible, like the Shadows). We meet other servitor races of the Shadows in episodes D10 and D11. The Markab appear in greater detail in episode B18. 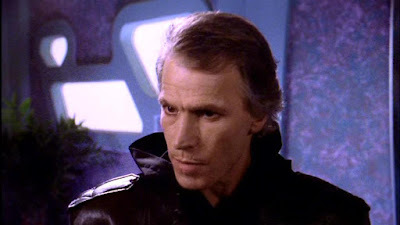 We learn in that episode that the Markab Ambassador seen here (who refers to the ‘Great Darkness’) is called Vershaar. The Earth Alliance Marine Corps, known as the ‘Ground-Pounders’ or GROPOS, appear in force in episode B10. Background: Earth made contact with the Centauri approximately 100 years ago and the Centauri sold jump gate technology to Earth, allowing humanity to expand into space. Before then Earth had only sent a few slower-than-light cryo-ships into space. These weren’t meant to be coloniser vessels (they only had a few crewmen on board each one) but instead to scout out potential worlds for colonisation. Garibaldi and Amis both served in the Earthforce Marines during the Earth-Minbari War. The Markab Confederacy are one of the member-races of the League of Non-aligned Worlds. We learn in later episodes that they are a deeply spiritual people. Amos’s moon is located in Sector 18 by 70 by 59. The “Soldier of Darkness” appears to be about fifteen feet tall, has horns and a vaguely devil-like appearance. It can turn invisible at will and feats on the internal organs of living entities. It can also leech off living beings to preserve its lifeforce indefinitely in a parasitic manner. According to the illustration in The Book of G’Quan, it also has a snouted face. Garibaldi still sees psychologists to discuss his traumatic experiences during the Earth-Minbari War. The Drazi enjoy live food. Devalera is a drug used to treat cardiac arrest in humans. Long-term cryogenic suspension is a proven technology in the B5 universe. References: The Copernicus is named for Nicolaus Copernicus, the Prussian astronomer who advanced the theory in the early 16th Century that the Earth orbited the Sun rather than vice versa. His work was built on by Galileo. Unanswered Questions: Did the alien know that Amis was on Babylon 5? Or was it just a massive coincidence that he was there at the same time? 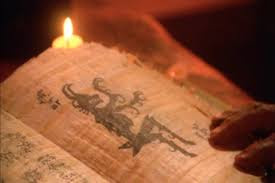 How do the Markab know so much about the “Great Darkness”? Why do Sheridan, Ivanova, Franklin and Garibaldi – the station commander, executive officer, chief medical officer and chief security officer – all board the Copernicus first? Shouldn’t security and science teams have swept it first? Mistakes, Retcons and Lamentations: The alien attacked the outpost on the Minbari moon probably in 2246 or 47. The Copernicus must have passed by some months or years later. The ship then reached Babylon 5 – travelling at sublight – a decade or so later. However, unless the alien somehow radically increased the ship’s velocity, it is unlikely the ship had enough time to reach Epsilon Eridani from another system at sublight speeds, based on the modest speed it was travelling at the start of the episode. It probably should have taken several decades, not just one. Similarly, it would have taken the Copernicus hundreds of thousands, if not millions, of years to reach Z’ha’dum. The Soldier of Darkness may be patient, but is it that patient? Behind the Scenes: The opening title sequence is, yet again, tweaked to show Keffer’s promotion to full Lieutenant. Jerry Doyle, a fan of The A-Team, enjoyed acting with Dwight Schultz, finding him to be professional but also a lot of fun. Andreas Katsulas found wearing the Narn prosthetic chest piece to be uncomfortable, so worked out a deal with Straczynski where it would only be necessary to show it two or three times a season. The final “creature reveal” effect was nowhere near as elaborate as Straczynski had hoped. 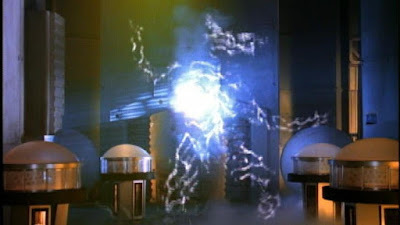 The director realised they couldn’t do the scene justice and adjusted accordingly, trying to evoke the battle against the invisible alien in Forbidden Planet, but this resulted is the episode building to a confrontation with a creature no-one could see. Straczynski felt this hampered the episode’s quality. Richard Biggs was unhappy with how Franklin was shown to be attracted to a traumatised woman who’d just lost her husband, feeling it was out of character for him. Some rewrites were incorporated into the script where the morality of the situation is addressed. 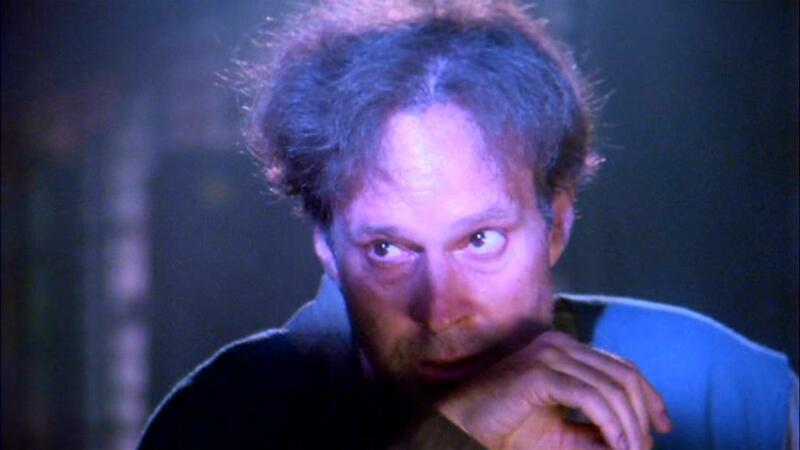 Familiar Faces: Dwight Schultz is best-known for playing Murdock in The A-Team and Lt. Reginald Barclay in multiple episodes of Star Trek: The Next Generation and Voyager, as well as the movie First Contact. Writer Scott Frost is a writer on The X-Files and the brother of Mark Frost, who co-created Twin Peaks. Plot: Taro Isogi, the head of Futurecorp., arrives on Babylon 5 to conduct business negotiations with Amanda Carter, a representative of the Mars Provisional Government. Following the Mars Rebellion last year (A18-A19) Mars’ new legal government is attempting to get support from Earth’s megacorporations to allow it to become independent by legal means, rather than violence. The negotiations, overseen by Talia Winters, proceed satisfactorily, but then Isogi is brutally murdered by a man saying “Free Mars!” Garibaldi identifies the man (via his DNA traces) as Abel Horn, a member of Free Mars, the terrorist group who spearheaded the rebellion. Amanda Carter is confused, since the negotiations between Mars and Futurecorp. would have benefited Mars. The cause is diminished by Isogi’s death. Garibaldi and Sheridan continue their investigations and discover that Abel Horn is supposed to be dead. His fighter was shot down by the EAS Pournelle during the rebellion and destroyed after he escaped from a prison camp on Mars’ smaller moon, Phobos. Sheridan tells Garibaldi that he used to collect information on covert groups and organisations, including one called “Bureau 13”, and wonders if they are involved here. He also recalls a now-banned experiment to suspend people at the point of death and subsume their conscious mind with cybernetic implants, turning them into mindless agents. The experiments were banned but perhaps they have continued in secret. Sheridan resets the station scanners to scan the interior of the station for a cybernetic power source and quickly locates Horn. Horn, meanwhile, is suffering intense flashbacks to his prior life. He contacts Amanda, who used to be in Free Mars, and blackmails her into getting Talia Winters to her quarters. Horn knows she is a telepath and plans to have her free him from his implants. Sheridan and Garibaldi burst in and are forced to shoot him. Horn’s body self destructs, leaving behind no evidence. 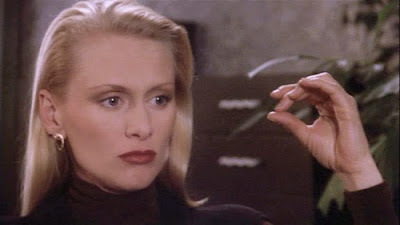 On Earth, under the ruins of the destroyed city of San Diego, California, the Psi Cop who runs Bureau 13 receives a report from her agent on Babylon 5, “Control”, informing her of the failure of the project. She orders Control to maintain a careful eye on events on the station and continue to report in. The Arc: Bureau 13 is a dirty tricks organisation on Earth with links to the Psi Corps. According to JMS, Bureau 13 eventually becomes redundant and is absorbed into the main body of Psi Corps itself by the end of the season. We learn the identity of their agent “Control” on Babylon 5 in episode B19. The Mars Rebellion may have been defeated by Earthforce, but the uprising had a positive outcome in that a semi-autonomous Mars authority – the Mars Provisional Government – was established. Mars’s resolve is pushed to breaking point in episode C10 but is rewarded in D21. In episode A8 we saw Garibaldi reading a paper which, among many other intriguing articles (some referenced in episodes B2 and B4), announced that San Diego was still too radioactive for resettlement (we learned in episode A1 that San Diego had been destroyed by a terrorist nuclear bomb). The end of this episode - where we see that Bureau 13 has a secret base under the blasted city - indicates that this may actually be incorrect. Senator Voudreau overrides Sheridan’s legal and ethical concerns with bland rhetoric, a harbinger of the sort of stuff the Ministry of Peace and the Nightwatch start doing in episode B17. Ivanova says that Talia Winters is trustworthy and “interesting”, which bemuses Sheridan. Ivanova notes that Talia is loyal to the Corps but is a good person in her own right. This reflects their growing friendship after they buried the hatched in episode A17. Sheridan’s fascination with black ops, secret groups and conspiracies explains a lot of what happens later on, particularly revelations at the end of episode A11. Background: The Mars Provisional Government is a semi-autonomous body which controls Mars under the aegis of EarthGov. The name and organisation appear to be a sop to the idea that Mars might one day, in the conveniently vague future, be free but not yet. The Mars Conglomerate appears to be a group of Earth megacorporations with business interests in Mars. The Conglomerate appears to be opposed to Martian independence, at least whilst they are still able to financially exploit the colony. There is a penal colony on Phobos, Mars’ smaller moon. The EAS Pournelle (an Omega-class destroyer, the same class as the Agamemnon) was one of several Earthforce destroyers that blockaded Mars during the uprising to prevent rebels escaping. This is the first-ever episode of Babylon 5 to have a sequence actually set on Earth itself (as opposed to news reports and video communications shown on-screen). Ivanova threw a Psi Corps telepath out of a 3rd floor window on Io. He landed in an “ample” pool. Also, Io’s quite low gravity means that this fall would have not been fatal or even likely to result in injuries. Abel Horn was born 17 July 2221. In 2252, he was sentenced to Phobos Maximum Security Outpost for helping steal 50 million Mars Conglomerate credits. He served one year before being transferred to Lunis Planum Prison Base. He served three months before escaping on 16 April 2253. During the Mars Rebellion in 2258 his ship was shot down by the EAS Pournelle. Horn was responsible for the destruction of Richie Station in a Free Mars attack. Friends of Sheridan and his wife were killed in the atrocity. Talia Winters was raised by the Psi Corps from the age of five, and has barely had any contact with her non-telepathic parents ever since. She was looked after by a woman named Abbie, who helped her acclimatise to life in the Corps. Alfredo Garibaldi, Michael’s father, was a cop. He was still hauling in perps at the age of 75 but had to retire after being diagnosed with a wasting disease. References: The EAS Pournelle is named after Jerry Pournelle, a prolific science fiction author. He is arguably best-known for his blockbuster collaborations with Larry Niven which hit the New York Times bestseller lists, namely Lucifer’s Hammer (1977) and Footfall (1985). His most recent book was also with Niven, Escape from Hell (2009). Niven and Pournelle are currently collaborating on a new novel, Lucifer’s Anvil (not related to Lucifer’s Hammer). Transport vessel Matheson is mentioned, a nod to Richard Matheon, the author of the famous novel I Am Legend. Amanda Carter’s grandfather is John, so therefore named John Carter. John Carter was the hero of Edgard Wright Burroughs’s Barsoom series of novels, starting with A Princess of Mars. Unanswered Questions: What really happened to Bureau 13? In Straczynski’s original plan, who was “Control” supposed to be? Mistakes, Retcons and Lamentations: “Control” is identified here as male, which is not the case when they are unmasked in episode B19. This is down to the significant arc-rewriting that Straczynski had to do to write that episode, which we will discuss at that time. Bureau 13 is never seen or mentioned again, although it is assumed to be part of the same Psi Corps/EarthGov dirty tricks group implicated in everything from Cypher (in the comics) to the conspiracy against Santiago to Home Guard. The reasons for it not being mentioned again are down to perceived legal issues (see below). In one of the show’s biggest mistakes, in the shot of B5 after Sheridan says “No evidence” near the end of the episode, you can see through the docking bay, through the station’s hull and into space. Behind the Scenes: Straczynski introduced Bureau 13 as a black ops group within the Earth Alliance working without legal oversight. After the episode aired, Straczynski learned that there was a popular pen-and-paper roleplaying game called Bureau 13. He contacted the game company and apologised for inadvertently using the same name. There was some discussion of using the name with permission, but Straczynski elected to drop it instead. The episode’s first draft took Talia and Garibaldi more in the direction of having a relationship. However, Straczynski had already decided to have Talia and Ivanova get involved and cut back a lot of that material as he didn’t want to complicate things too much. Larry DiTillio disagreed, thinking that a love triangle between the three characters would have been more interesting and informed by Jerry Doyle and Andrea Thompson's real-life relationship, which had started by this time. Familiar Faces: Adrienne Barbeau (Amanda Carter) appeared in several of John Carpenter’s movies (arguably most memorably in Escape from New York), and was married to him for a time. Jessica Walters (Senator Voudreau) had already established a respectable career by this point, but became even more famous after Babylon 5 for her roles in Arrested Development and Archer, playing the formidable Mallory Archer (the mother and occasional nemesis of hero Sterling Archer). This episode marks the debut of Jeff Conaway as Security Officer Zack Allen. Conaway is best-known for playing Kenickie in the 1978 movie Grease and Bobby Wheeler on the first three seasons of Taxi. Conaway watched the first season of Babylon 5 at home and ordered his agent to get him on the show by any means necessary, even if it was a tiny role. Straczynski created the role of Zack Allen for him, which started off as a glorified extra but later evolved into a series regular. Jeff Conaway sadly died in 2011 from pneumonia and encephalopathy, complicated by a history of substance abuse. Michael Beck (Abel Horn) is best-known for playing Swan in the 1979 movie, The Warriors (and its 2005 video game adaptation) and Malone in Xanadu (1980). 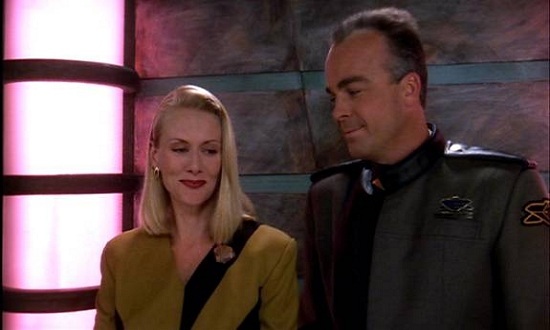 He was close friends with Kevin G. Cremin, Babylon 5’s production manager and the director of this episode, and agreed to do this episode at a lower pay rate as a favour to him. James Shigeta (1929-2014), who played Taro Isogi, was an American-Japanese actor, born in Hawaii. He served in the US Marine Corps during the Korean War. He’d begun his acting career in Los Angeles in the late 1940s, where he became known as a singer. After failing to break into the movies in the USA, he moved back to Japan and starred in many films for Toho Studios throughout the 1950s. He finally broke Hollywood in the 1960s, and was critically acclaimed for his role in Walk Like a Dragon (1960), where he played a Asian character who spoke like a regular American rather than in a racially-stereotyped accent. In 1988 he appeared in the iconic action movie Die Hard. His last roles were as the Old Wanderer in the animated series Avatar: The Last Airbender (2005) and as Charles Yang in The People I’ve Slept With (2009).